heh, my brother in law has one of these, i just sent it to him. (03-11-2017 02:51 PM)canuckster Wrote: [ -> ] heh, my brother in law has one of these, i just sent it to him. But when he asks if it's connected to the CIA, it will probably say "No, I work for Amazon". So it's probably been updated. So when it does this, have him ask "Alexa, is Amazon connected to the CIA?" If he does this next step...it will shut down. I just did the same thing with Siri on my iphone, and got much the same response. The difference being that when I ask Siri the question, it responds with "who me"? and when I say Yes Siri, you. It responds with "that's what I thought", and we begin again. ^^^Sounds like an Abbot and Costello skit. "Are you, Siri, ______ ?" Alexa is a very obvious way for Amazon, and the Government to have ears in your home. Even when you aren't asking it questions, it is there listening. Siri has already helped to convict people who incriminated themselves by asking questions such as "how do I dispose of a body", after they had killed someone. Alexa is currently involved in a murder case. What does it say when you ask if God exists? This site simulates Alexa in your broswer, you must have an Amazon account to use it though. Quote: Amazon today announced the availability of Echosim.io, a website that simulates the capabilities of the Amazon Echo speaker, which employs Amazon’s Alexa voice assistant technology. The thing about Alexa is that many people who don’t own the Echo — or its smaller siblings, the Tap and the Echo Dot — haven’t been able to see what Alexa is capable of. The new tool — which was inspired by the Alexa in the Browser application that Nexmo developer advocate Sam Machin came up with during a hackathon last year — solves that problem. All you have to do is head to the website, sign in with your Amazon credentials, and start holding your mouse down over the microphone button to see what Alexa can do. Quote: Alexa processes and retains audio and other information in the cloud to provide and improve our services, and may exchange information with third party services to fulfill your requests. 3. Can I review what I have asked Alexa? You can delete specific voice recordings associated with your account by going to History in Settings in the Alexa App, drilling down for a specific entry, and then tapping the delete button. 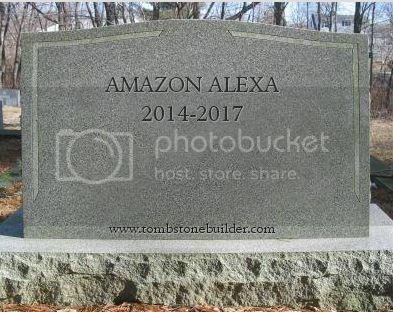 Or, you can delete all voice recordings associated with your account for each of your Alexa-enabled products, by selecting the applicable product at the Manage Your Content and Devices page at http://www.amazon.com/mycd or contacting customer service. 5. How do Alexa skills work? 6. How does shopping work? 7. Can I turn off purchasing? Yes, Alexa has voice purchasing settings. Visit Settings/Voice Purchasing in your Alexa App to turn off purchasing by voice from Amazon. You can also require an optional confirmation code that Alexa will ask you to say out loud when you want to place an order from Amazon. 8. What are the return policies for products I order using Alexa? For information on return policies applicable to products purchased using Alexa, see About Our Returns Policies. In addition, non-digital products purchased using Alexa are eligible for free returns. To return a product purchased using Alexa, process your returns as normal in the Returns Center. We’ll automatically refund you any shipping charges applied to the return. You should see the shipping refund within 7 days of receiving your product refund. In addition, if you accidentally purchase a song or album from our Digital Music Store using Alexa, that purchase is eligible for return and refund if we receive your request within seven days of the date of purchase. To request a refund, contact customer service. Amazon Echo and Echo Dot are far-field Alexa-enabled devices. 1. How do Amazon Echo and Echo Dot recognize the wake word? 2. How do I know when Amazon Echo or Echo Dot are streaming my voice to the Cloud? When Amazon Echo or Echo Dot detect the wake word, when you press the action button on top of the devices, or when you press and hold your remote's microphone button, the light ring around the top of your Amazon Echo turns blue, to indicate that Amazon Echo is streaming audio to the Cloud. When you use the wake word, the audio stream includes a fraction of a second of audio before the wake word, and closes once your question or request has been processed. Within Sounds settings in the Alexa App (Settings > [Your Device Name] > Sounds), you can enable a 'wake up sound,' a short audible tone that plays after the wake word is recognized to indicate that the device is streaming audio. You can also enable an 'end of request sound' that will play a short audible tone at the end of your request, to indicate that the connection has closed and the device is no longer streaming audio. 3. Can I turn off the microphone on Amazon Echo and Echo Dot? Yes, you can turn Amazon Echo or Echo Dot's microphone off by pushing the microphone on/off button on the top of your device. When the microphone on/off button turns red, the microphone is off. The device will not respond to the wake word, nor respond to the action button, until you reactivate the microphone by pushing the microphone on/off button again. Even when the device’s microphone is off, Amazon Echo or Echo Dot will still respond to requests you make through your remote. Amazon Tap is an Alexa-enabled portable speaker that includes an optional hands-free mode. 1. How do I activate hands-free mode on my Amazon Tap? You can turn hands-free mode on or off in the device settings within your Alexa App (Settings > [Your Device Name]). 2. How does Amazon Tap recognize the wake word while in hands-free mode? Amazon Tap uses on-device keyword spotting to detect the wake word. When the wake word is detected, Amazon Tap streams audio to the Cloud, including a fraction of a second of audio before the wake word. 3. How do I know when Amazon Tap is streaming my voice to the Cloud? When Amazon Tap detects the wake word in hands-free mode or when you tap the microphone (talk) button, the lights on the front of your Amazon Tap turn blue to indicate that Amazon Tap is streaming audio to the Cloud. When you use the wake word while in hands-free mode, the audio stream includes a fraction of a second of audio before the wake word, and closes once your question or request has been processed. You will also hear a short audible tone that plays after the wake word is recognized, to indicate that the device is streaming audio, and at the end of your request, to indicate that the connection has closed and the device is no longer streaming audio. 4. Can I turn off the microphone on Amazon Tap while in hands-free mode? Yes, you can turn Amazon Tap's microphone off by pushing the play/pause button on the top of your device for three seconds. When the lights on the front of your Amazon Tap turn red, the microphone is off. The device will not respond to the wake word until you reactivate the microphone by pushing the play/pause button again for three seconds. When the microphone is off, Amazon Tap will still respond to requests you make by tapping the microphone (talk) button. After five minutes of inactivity with the microphone off, your device will enter sleep mode to conserve power.